Yummy Bento Friendly Vegan and Vegetarian Recipes! All Hail Seitan! I love tofu but in the vegetarian world one can only eat so much of it. Wheat meat is a great alternative that sometimes (when prepared properly) even comes a little too close to meaty flavors! Mix together the dry ingredients very thoroughly in a large mixing bowl. Pour the wet ingredients into the dry ingredients and mix QUICKLY with a wooden spoon until most of the moisture has been absorbed. The dough will look clumpy and crumbly. Before my recent trip to Austin I have never heard of tomato pie. My palette had not yet been dazzled by the sweet and savory blend of freshly baked tomatoes, buttery crisp crust, basil, feta cheese, and kalmenta olives. My boyfriend and I were walking down on Guadelupe St. when I saw the Kerby Lane sign proclaiming tomato pie. I insisted that we go latter that day to taste the pie. It was amazing. Since my return from Austin last week I have made 3 tomato pies. I don't really use recipes so it took a couple tries to get it perfect. I used a vegan spelt crust (I still haven't mastered making my own pie crust), tomatoes basil and parsley from my garden, and some store bought olives. I did not anticipate how juicy the tomatoes were nor that they would sweat even more while baking. 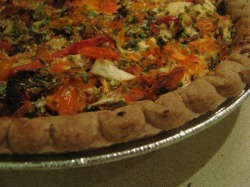 The pie was still very good but the flavors were not as concentrated as I wanted them to be. I have recently been experimenting with veganism and I chose to leave off the feta cheese- though it was an amazing addition to the original. In my next pie I squeezed the juice out of the tomatoes. This really helped. I then dehydrated the tomato innards for a soup later on. I baked the tomatoes to dry them out even more. My last pie had not been as dense as I wanted and it did not really stick together all that well so I added some soy "cheese." This also helped but I didn't like deviating from the original Kerby Lane pie. It stuck together much better. It was my third pie that turned out just right. I did decide to deviate from the original recipe and added crumbled home made tofu to the pie, hoping to make it denser and stick together without the soy "cheese." I love the way this turned out. After squeezing the tomato juice out and roasting them I mixed the tomatoes up with the tofu, some dried tomatoes and basil from the garden, along with some dried onions. This really added the intense tomato flavor I was looking for. For the most part the dried tomatoes were not chewy because they absorbed the moisture from the fresh tomatoes. At the end you may add feta cheese and let it brown.